iRealHousewives | The 411 On American + International Real Housewives: Real Housewives Of Melbourne Newbie Venus Behbahani-Clark Says Gamble Breaux ‘Makes S**t Up All The Time’ And Explains The Real Reason Their Husbands Fight In Season 4 Trailer! 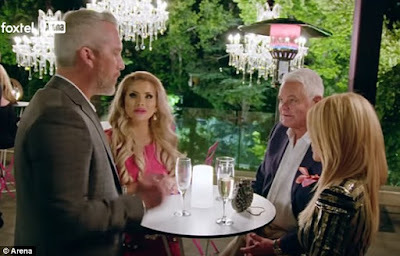 As seen in the Season 4 extended trailer of The Real Housewives of Melbourne, Venus Behbahani-Clark and Gamble Breaux's husbands are seen clashing. During a recent interview, newcomer Venus and Gamble tried to explain what exactly went down. Venus slammed Gamble for saying Venus' husband James, "shoved a camera," then Venus says Gamble "makes s**t up all the time!" "I put a post congratulating both of our husbands," Venus told The Daily Mail Australia. Then, Gamble cuts in, saying James was put offside. "Unfortunately James didn't take things well in the beginning...He shoved a camera," Gamble said, with Gamble being married to eye surgeon Dr Rick Wolfe. Venus hit back, arguing James didn't do anything of the sort. "No he didn't! That's a lie, she makes s**t up all the time. All he did, he came up to me and said "darling, are you okay?" And just pulled the camera to the side. He didn't do that." Gamble said she and her eye surgeon husband Dr. Rick Wolfe saw it happen. "Rick saw it happen and Rick came in and settled James down," Gamble said. Meanwhile, Venus defended her hubby, and called him "beautiful." In a sneak peek for the show's upcoming fourth season, which premieres on Wednesday, December 6 at 8:30pm on Foxtel, James is seen talking to Venus, Gamble and Rick, and says the couple "attacked my wife." Are you guys ready for Season 4 of The Real Housewives of Melbourne?! Sound off in the comments below!